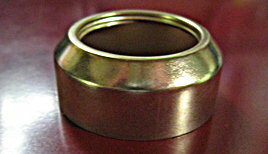 This collar is a lighter gauge brass and has no groove lines, and is not lacquered (so easy to add patina). Otherwise it is the same size as the #2 heavy gauge plain collar. Return to the COLLARS page.